With their future an open calendar, Commencement speaker Dr. Stacy Jackson encouraged the members of Hope College’s graduating Class of 2013 to be deliberate in choosing how they fill it. “Everyone says that values matter, and they do. The challenge is that we have so many of them. We have to choose which values we will make a priority and commit to them,” said Jackson, who is the Kenneth J. Weller ’48 Professor of Management and chairperson of the department of economics, management and accounting at Hope. He noted that the graduates’ top priorities should manifest in the lives they go on to lead. “If you value it, it has to show up in your calendar. Otherwise it’s not values, it’s just vanity,” he said. 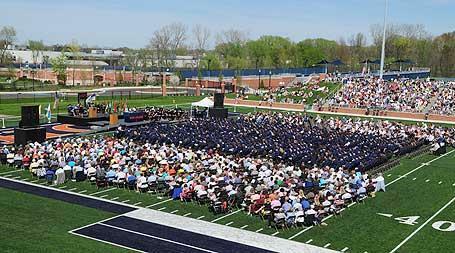 Approximately 670 graduating seniors participated in the ceremony, the college’s 148th, held at Ray and Sue Smith Stadium. The class consisted of students from throughout the United States as well as foreign nations including Afghanistan, Canada, China, Germany, Ghana, Japan, Mexico, Myanmar, Nigeria, Singapore, South Africa and Taiwan. Prior to the Commencement address, the college honored Richard Haworth and the late Gerrard W. Haworth in recognition of their leadership of Haworth, Inc. and commitment to the community and education, including significant impact on Hope across decades. Each was awarded the Doctor of Humane Letters (L.H.D. ), with Matthew Haworth, who is chairman of Haworth, Inc. and also Richard’s son and G.W.’s grandson, accepting G.W.’s award. In addition, the graduating class presented the 49th “Hope Outstanding Professor Educator” (H.O.P.E.) Award to Dr. Peter Schakel, who is the Peter C. and Emajean Cook Professor of English and chairperson of the department. The award, first given in 1965, is presented to the professor class feels epitomizes the best qualities of the Hope College educator. As he addressed the graduates, Jackson noted that being deliberate in choosing how to fill their life’s calendar will help assure that they will emphasize the values they’d prefer to make priorities. Jackson also encouraged the graduates to engage their values in community with others, but noted that doing so presents challenges of its own. They might struggle to find organizations whose values mesh with their own. “My advice to you in seeking to live out your values with others is to hold onto your desire for alignment. Don’t seek to leave too quickly. Be patient. Realize that change arrives long after the invitation has been sent,” he said. “In addition, realize that working for alignment among those you work with will take time and it won’t be handed to you. You have to be humble with others. “Having said that, seek excellence in what you value unapologetically and don’t accept the false humility that might be disguised as indecisiveness or an actual love for comfort,” he said. “In some cases you will need to leave where you choose to work; in some cases you will need to stay and grow. The graduation activities began in the morning with the college’s Baccalaureate service in Dimnent Memorial Chapel, during which the Rev. Jill Ver Steeg, who is a pastor at Meredith Drive Reformed Church in Des Moines, Iowa, and a member of the college’s Board of Trustees, delivered the sermon “Expecting Jesus,” exploring Jesus’s role as Messiah. She based her sermon on Matthew 3:1-12 and 11:2-11, which focus on John the Baptist. In Matthew 3, John is anticipating the coming of the Messiah and meets Jesus. In Matthew 11, John is imprisoned and questions whether or not Jesus is the Messiah he had been expecting, asking his followers to put the query to Jesus. In the same way, she said, Jesus’s ministry is a guide for those living today, simultaneously surprising and an example. “Friends, this is called expectancy—living in this broken world tethered to a foundation: ‘We believe in Jesus Christ, who came once and who will come again,’” Ver Steeg said.